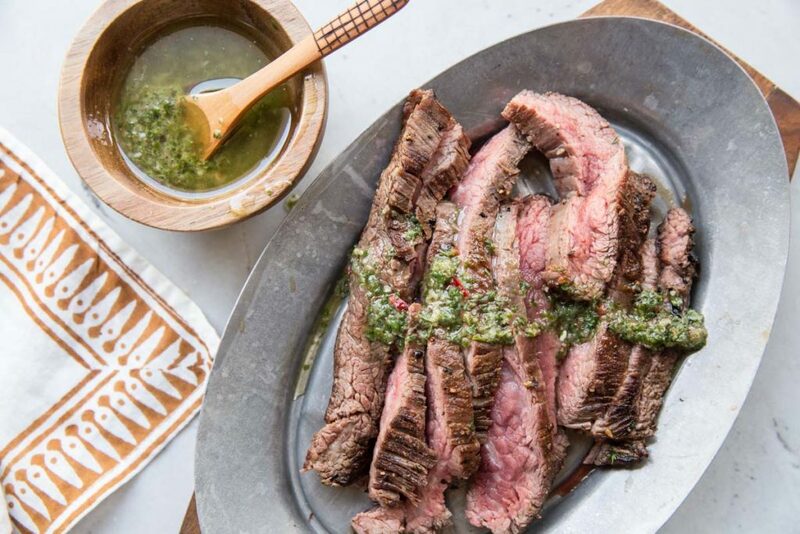 We are camping this weekend so I made Josh this Flank Steak with Chimichurri as an early Father’s Day celebration. If you’re looking for a great Father’s Day meal, look no further. 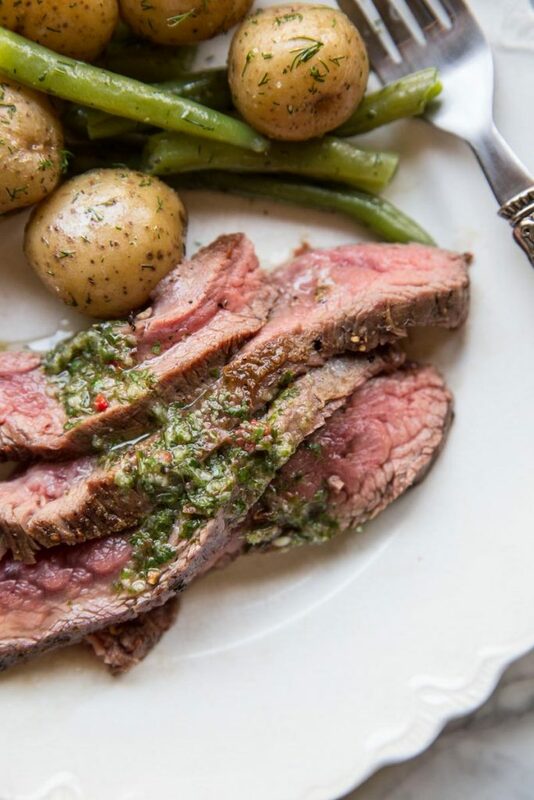 This steak is so simple to make and the sauce makes for a perfect special occasion meal. I always find the best flank steak at Harmons Grocery Stores. This post is sponsored by Harmons but all opinions are my own. The longer I’m married the more I know not to step outside the box too much with Josh, especially when celebrating him with a meal. Though he will eat just about anything, when asked what he wants for a special meal he refers to his roots: steak and potatoes. As you can see I didn’t branch out too much, but what I also know of my husband is that he’s a sauce guy so I wanted to elevate the steak with a good sauce. 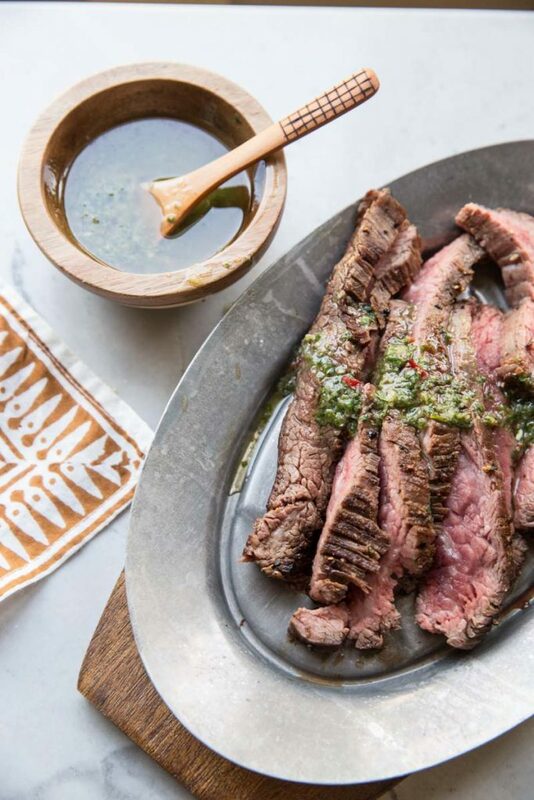 Chimichurri is a great sauce for steak, because of it’s acidity it balances the fat usually found in red meat. The richness of the meat is cut by the tartness of the sauce. And it adds so much flavor! 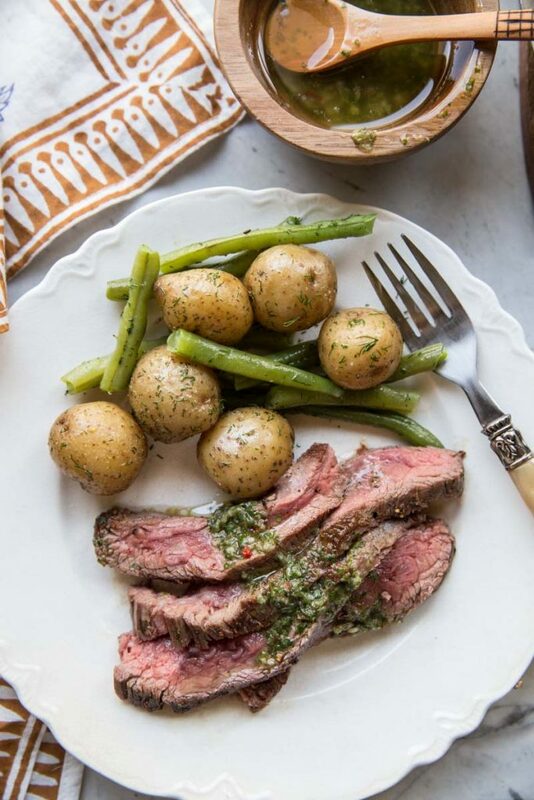 Here’s the full recipe for chimichurri. I like to make a big batch at the beginning of Summer then enjoy it for several meals. 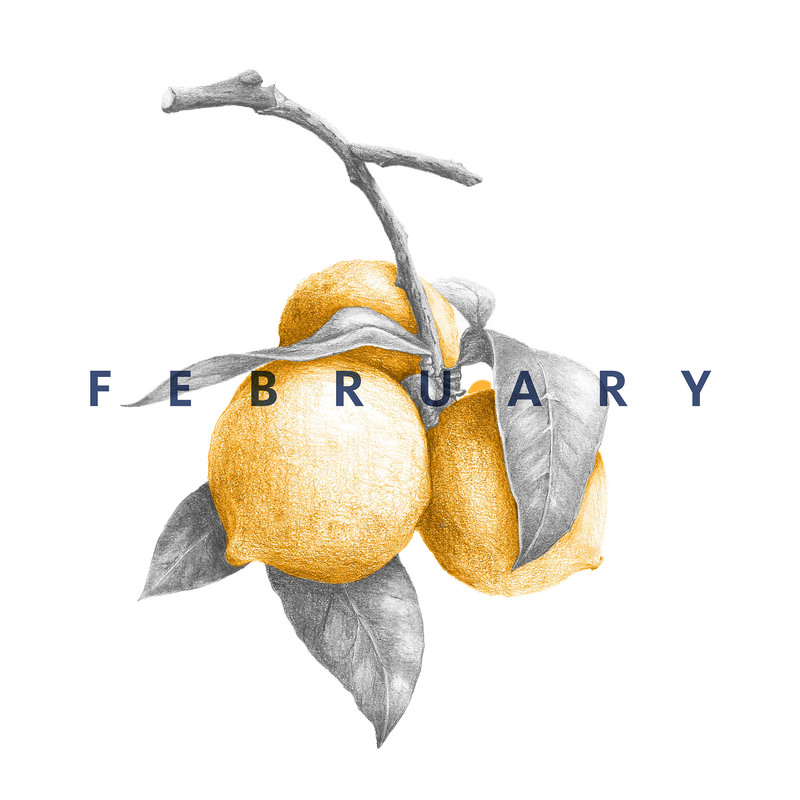 • A good steak always starts with a good steak. We like to buy our meat at Harmons Grocery Stores because we know we are ensured good quality from any meat in their meat department. As you can see in the recipe, once you have a good piece of meat, all you need is a salt and pepper and you’re on your way to perfect steak. Harmons also sells wonderful dry aged beef, which is perfect for celebrating dad or for a real special treat! •Use a good cast iron pan if you have one and get it really good and hot before even adding the butter on. • Always cook steak in high quality butter. Same goes with eggs and seafood like scallops. • Rain down the salt and pepper on your steak. Literally you want to coat the outside generously with seasoning. And just salt with freshly ground pepper will do the job, especially if you have a good sauce to go with it. 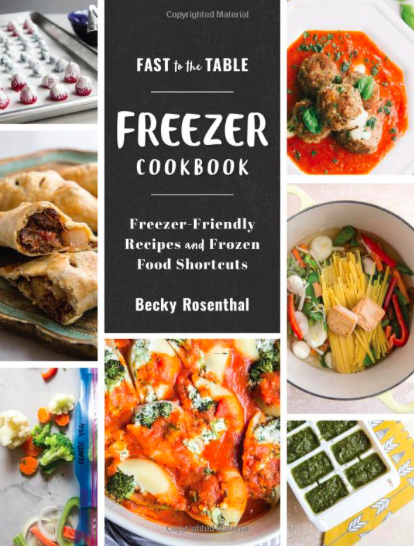 • Don’t move the steak around when you’re cooking it. Cook the best side down first then set a timer for 5 minutes and don’t flip it until the time goes off. Same goes with the second side. Cooking until the meat reaches 135 degrees. • Always let your steak rest for at least 10 minutes on a cutting board before cutting into it. This ensures it to keep its juiciness. 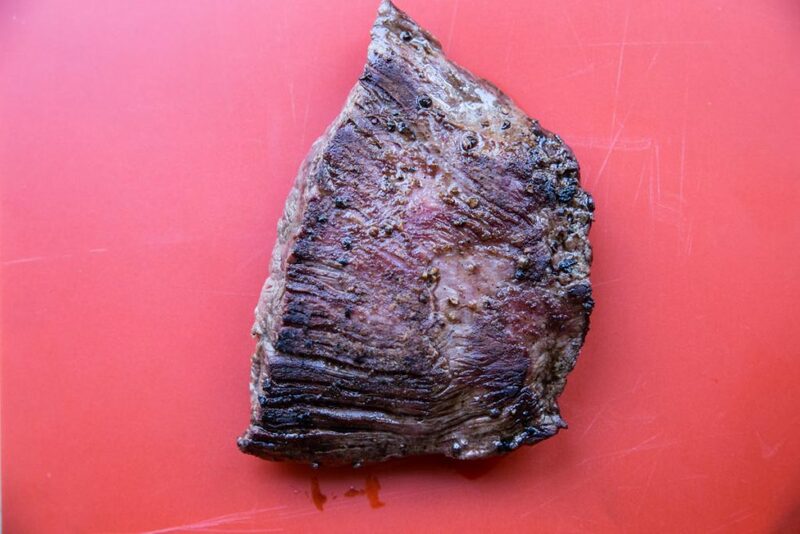 • Slice flank steak against the grain. • I served this up with potatoes and green beans, cooked in water then tossed with a little butter, salt and dill. 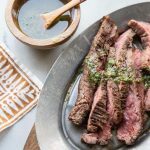 This simple flank steak recipe with chimichurri ensures a perfectly cooked steak with minimal prep. Season the front and back of the flank steak with generous salt and pepper. Heat up a cast iron pan on high heat. Once hot, add the butter and let melt but not brown. Add the steak to the pan, best side down first. Set a timer for 5 minutes and walk away (don't be tempted to move the steak around or it will lose it's crisp browning). Flip after 5 minutes and continue cooking on the second side for 4 minutes or until the meat reaches 135 degrees for medium. 5-6 minutes on the second side for more medium well. Let rest for 10 minutes then slice against the grain and serve with chimichurri sauce. Looks amazing and yes you know your man!! I’m not sure why it took me this long to figure this out… for years I wanted to make him something elaborate. When I ask him what he wants he never knows but when I cook him steak he licks the plate… ha!! Weird .. I thought you would be providing recipe for the sauce! Poor Josh just needed some meat! Looks quite delicious! Beltex Meats also carries a selection of high quality meats; I’ve had a lot of success using their meat in various recipes. I need to go by there! Thanks for the reminder Stephen!